Those Dancing Days bring their infectious tuneage to Union Hall tonight. 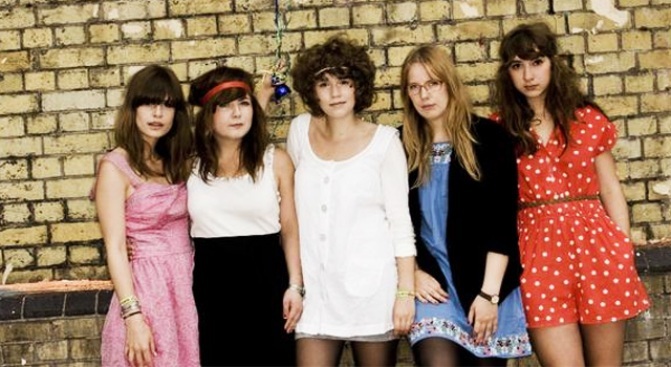 What: Swedish girl group Those Dancing Days plays at Park Slope's Union Hall tonight. Yes, they're named after the Led Zeppelin song, though the band's five members are far too young to have experienced Plant & Co. firsthand -- two of them graduated from high school in 2008. Why: These days, when all music seems to fall into either the lo-fi quirk category or the Miley Cyrusoeuvre, it's refreshing to hear unapologetically catchy bubblegum pop that's also really good. Heck, we're going to go ahead and declare their song Hitten (off debut album In Our Space Hero Suits) the official anthem of summer '09. (Check out the video here.) Also, frontwoman (front-teen?) Linnea Jönsson's curly mop is a hot contender for Best Hair in Music 2009.